Hello everyone, Pavtube has just updated their whole product line such as BDMagic, ByteCopy, Video Converter Ultimate, DVDAid, etc. This is an example of their ByteCopy program. Its fast and the decryption engine has been updated for all the new movies. Pavtube ByteCopy Windows version have updated to the new version! Good news!!! Here is the discount link of ByteCopy and ByteCopy for Mac especially for Myce.com members. Pavtube ByteCopy is your best tool to rip and convert Blu-ray movies and DVDs to MKV container format with multiple audio tracks and subtitle sincluded. Besides retaining multiple audio tracks and multiple subtitles in an MKV video without transcoding and quality loss, Pavtube ByteCopy is also able to encode the original soundtracks into 5.1 channels with your wanted language. 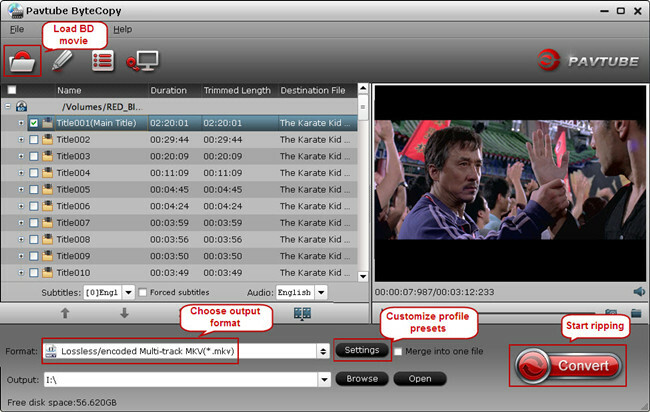 It preserves chapter markers in the converted MKV file. All that and more make it possible for you to easily select your needed tracks, subtitles, as well as chapters when watching Blu-ray and DVD movies with your media players. And other than that, you can backup and convert latest Blu-ray and DVD movies to any other formats like MP4/MOV with multi-track audios, M4V, AVI, WMV, MPG, M2TS, etc for playback on iOS/Android/Windows Tablets/Phones, HD Media Players (WDTV), editing software (Avid Media Composer, Adobe Premiere, etc. ), and more.